GREAT BRITAIN, 1916, 2sh6p Deep Yellow Brown De La Rue "Hoe" Press Seahorse, Imprimatur (173c var; SG 405 var). From the British Postal Museum & Archives, with "BPMA" handstamp on reverse, left sheet-margin single, Mint N.H. EXTREMELY FINE. A SUPERB AND RARE IMPRIMATUR OF THE TWO-SHILLING SIX-PENCE DE LA RUE SEAHORSE. GREAT BRITAIN, 1926, 2sh6p-10sh Bradbury Wilkinson Seahorses, "Dry Printing" Imprimaturs (179-181 vars; SG 413a-417 vars). From the British Postal Museum & Archives, with "BPMA" handstamp on reverse, each a right sheet-margin single, Mint N.H. EXTREMELY FINE. A BEAUTIFUL AND RARE MATCHED SET OF SHEET-MARGIN IMPRIMATUR SINGLES OF THE BRADBURY WILKINSON SEAHORSES. GREAT BRITAIN, 1924-26, -1/2p-1sh King George V, Cypher Block Wmk., Imprimaturs (187-200 vars; SG 418/429 vars). From the British Postal Museum & Archives, each with "BPMA" handstamp on reverse, set of thirteen (6p on both ordinary and chalky papers) in right sheet-margin singles, Mint N.H. EXTREMELY FINE. A STUNNING AND EXTRAORDINARILY RARE SET OF IMPRIMATURS OF THE 1924-26 KING GEORGE V DEFINITIVES. 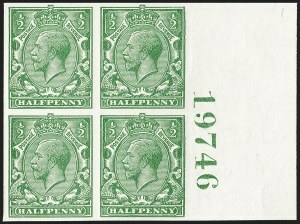 GREAT BRITAIN, 1924, -1/2p Green, Imprimatur (187 var; SG 418 var). From the British Postal Museum & Archives, with "BPMA" handstamp on reverse, right sheet-margin plate no. 19746 block of four, Mint N.H. EXTREMELY FINE. A RARE AND STRIKING PLATE NUMBER BLOCK OF FOUR OF THE 1924 HALF-PENNY KING GEORGE V.
GREAT BRITAIN, 1936, -1/2p-2-1/2p King Edward VIII, Imprimaturs (230-233 vars; SG 457-460 vars). 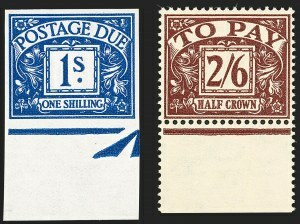 From the British Postal Museum & Archives, set of left sheet-margin singles, Mint N.H. EXTREMELY FINE. 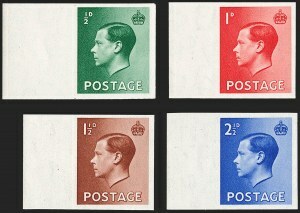 AN OUTSTANDING SET OF IMPRIMATURS OF THE 1936 KING EDWARD VIII SERIES. GREAT BRITAIN, 1937-47, -1/2p-1sh King George VI Definitives, Imprimaturs (235-248 vars; SG 462-475 vars). From the British Postal Museum & Archives, each with "BPMA" handstamp on reverse, set of fifteen in left sheet-margin singles, Mint N.H. EXTREMELY FINE. A PRISTINE AND EXCEEDINGLY RARE SET OF IMPRIMATURS OF THE 1937-47 KING GEORGE VI DEFINITIVES. GREAT BRITAIN, 1939-48, 2sh6p-£1 King George VI Arms, Imprimaturs (249-251A vars, 275 var; SG 476-478c vars). From the British Postal Museum & Archives, each with "BPMA" handstamp on reverse, set of six values in bottom sheet-margin singles, £1 perforated, Mint N.H. EXTREMELY FINE. A HANDSOME AND RARE SET OF IMPRIMATURS OF THE KING GEORGE VI HIGH VALUES. Only a small number of imprimaturs from this series exist in any form. The BPMA sale had a set in strips of seven and a set in strips or blocks of four. These were broken up into singles and pairs. They also had the unique registration blocks which are probably still intact. GREAT BRITAIN, 1939, 10sh Dark Blue King George VI Arms, Imprimatur (251 var; SG 478 var). 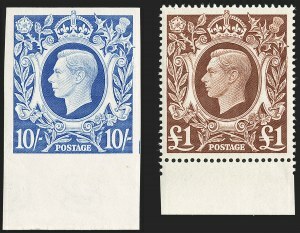 From the British Postal Museum & Archives, with "BPMA" handstamp on reverse, horizontal pair with No. 40840 and central sheet cross in the wide top sheet margin, Mint N.H. EXTREMELY FINE. 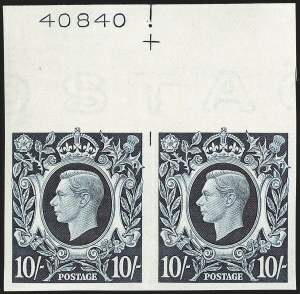 A SUPERB SHEET-MARGIN IMPRIMATUR PAIR OF THE 1939 10-SHILLING DARK BLUE KING GEORGE VI "ARMS". GREAT BRITAIN, 1949, 2-1/2p-1sh U.P.U., Imprimaturs (276-279 vars; SG 499-502 vars). From the British Postal Museum & Archives, with "BPMA" handstamp on reverse, each a left sheet-margin single, Mint N.H. EXTREMELY FINE. A WONDERFULLY WELL-MATCHED SET OF IMPRIMATURS OF THE 1949 U.P.U. ISSUE. GREAT BRITAIN, 1951, 2-1/2p-4p Festival of Britain, Imprimaturs (290-291 vars; SG 513-514 vars). From the British Postal Museum & Archives, each with "BPMA" handstamp on reverse, right sheet-margin singles, Mint N.H. EXTREMELY FINE. A BRILLIANT EYE-APPEALING SET OF IMPRIMATURS OF THE 1951 FESTIVAL OF BRITAIN ISSUE. GREAT BRITAIN, 1955, 2sh6p-£1 Castles, Waterlow Printing, Imprimaturs (309-312 vars; SG 536-539 vars). From the National Postal Museum, with their handstamp on the reverse of each, left sheet-margin singles, Mint N.H. EXTREMELY FINE. A VERY RARE AND CHOICE QUALITY SET OF IMPRIMATURS OF THE 1955 WATERLOW CASTLES. 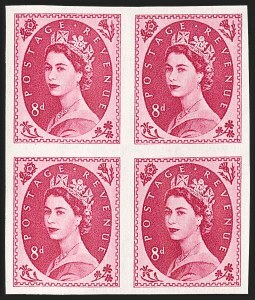 GREAT BRITAIN, 1955, 8p Magenta, Imprimatur (327 var; SG 550 var). From the National Postal Museum Archives, with their handstamp on reverse, block of four, Mint N.H. VERY FINE AND CHOICE. A BRILLIANTLY FRESH AND RARE IMPRIMATUR BLOCK OF THE 1955 8-PENCE WILDING. GREAT BRITAIN, 1957, -1/2p-3p Wilding with Graphite Lines, Imprimaturs (353c-358c vars; SG 561-566 vars). From the British Postal Museum & Archives, each with "BPMA" handstamp on reverse, bottom right corner sheet-margin singles, Mint N.H. EXTREMELY FINE. A BEAUTIFULLY MATCHED SET OF IMPRIMATURS OF THE 1957 WILDING WITH GRAPHITE LINES SERIES. GREAT BRITAIN, 1967-68, 2sh6p-£1 Castles, Bradbury Printing, Imprimaturs (525-528 vars; SG 759-762 vars). From the National Postal Museum, with their handstamp on the reverse of each, includes additional 2sh6p from the 1968 printing (SG 595k), £1 perforated, Mint N.H. VERY FINE AND CHOICE. AN EXCEEDINGLY RARE SET OF IMPRIMATURS OF THE BRADBURY CASTLES. GREAT BRITAIN, 1937-38, -1/2p-2sh6p Postage Dues, Imprimaturs (J26-J33; SG D27-D34). From the British Postal Museum & Archives, each with "BPMA" handstamp on reverse, bottom sheet-margin singles, 2sh6p perforated as always, Mint N.H. EXTREMELY FINE. A VERY RARE SET OF IMPRIMATURS OF THE 1937-38 POSTAGE DUE SERIES.